'Episode 10 is all about the invasion; it’s D-Day,' says series creator Steven Kane. The scenes of the Marines and Naval Special Forces storming the beach in Colombia under heavy fire were impressive. Were you inspired by the opening scenes of Steven Spielberg’s Saving Private Ryan? Steven Kane: We were definitely inspired by Saving Private Ryan, recognizing that they had Steven Spielberg and that they had as much time and money as they desired to shoot their invasion. Meanwhile, we had Steven Kane and two-and-a-half days to shoot it. Wow. How challenging was that? It was challenging, but it was the best way to finish the show. In fact, our very last day of production was on the beach. It was a nice farewell to the cast and crew to go out with that kind of accomplishment. How did you do it? You had all these amphibious vehicles and lots and lots of military in those scenes. They said yes and we brought nine cameras and a drone to film their exercise, which had these amphibious assault vehicles exiting from the back of a big amphibious ship. It was just great B-roll. Then in September, we went back and filmed a sequence based on what I had seen that day. The Marines let us use tanks that were sitting there and a lot of off-duty Marines acted as extras on the beach. We had about 500 people on the beach, we had two crews, we were blowing thing up constantly and moved a mile a minute. Luckily, everything worked out. The entire season was mostly non-stop action! Why the change? We’ve had plenty of action over the years, but this is the first season that was really just about war. The other ones were about missions — about finding a cure, distributing a cure, etcetera — and the battles were incidental to the bigger mission. The show began as an action adventure show; the first season was very popcorn in a good way. In general you felt like they were going to a gunfight and they’d come out unscathed. 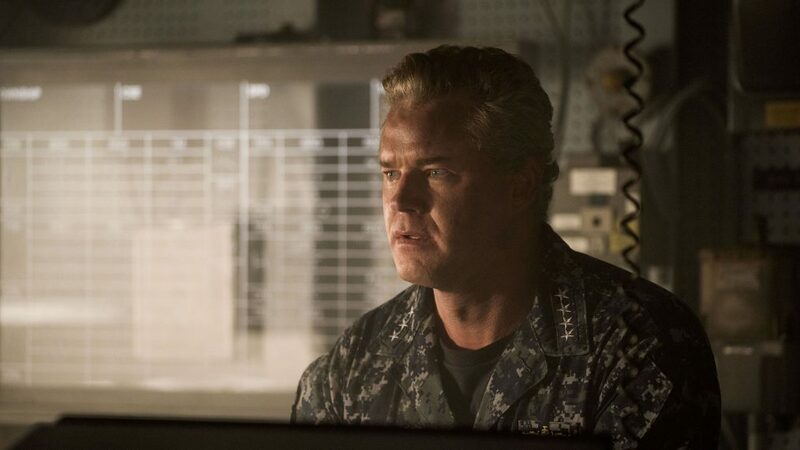 As the show matured, as Chandler’s character matured, he went from being an average captain of an average ship, to being the man who saved the world, to watching so many of his people die under his command and seeing the pain and the suffering of what war does. These people s are heroes but they’re very much human, and war is bad for humans. So, I wanted to tell a war story that showed how these warriors remained heroes, but how much they have to sacrifice to do so. Chandler is haunted by the specter of his own death, and the guilt of all those people who died under his command. You did kill off a lot of the cast this season. When people complain, "I can’t believe you killed of so-and-so" or "I can’t believe he lost his leg," the point is not to be gratuitous, but that these people have been through war for too long, and they’re going to suffer as a result. Tom Chandler suffered but in the end he didn’t die. Did you consider a heroic death for Chandler? I didn’t think it was appropriate for Chandler to die. This show has always been about hope. We’re going to show you a lot of terrible things, we’re going to show you a virus that destroyed most of the planet, and killed in the most painful way; we’re going to show you people behaving really badly in the aftermath of an apocalypse, and we’re going to show you the fight to change the status quo of the planet as a result of this apocalypse. We’re going to show you tyrants; we’re also going to show you people acting honorably. Chandler said at the end of Season 4, when he was confronting the villain, Dr. Vellek (Peter Weller), that being human doesn’t mean cutting out the dark, it means fighting to find a light. So although he watches his ship go down, and he sees [a vision of his dead] friends in Davy Jones’ locker, he finds the light. He hears his daughter’s voice and she’s the hope for the future. It was a very natural ending for him to swim back up to the surface and live to hopefully find some peace. So where do you see Tom’s future? With Sasha (Bridget Regan) on the sailboat she envisions? Or saving the world again as POTUS? The writer’s room had actually created an epilogue for the show, but in the end, the episode would have been too long and too expensive. I’m glad we never shot it; I actually like leaving that open for the audience. I do think that viewers know that he’s gone toward the light so they can see a hopeful future for him. After his final kickass fight with Tavo’s guards, Wolf (Bren Foster) was shot multiple times. Since you seem to be ending with some hope, can we assume he’ll make it too? I didn’t know when I hired him that he was a martial arts champion. When I found out we gave him some good fights, and at the end I wanted to give Wolf the mother of all fights. And yeah, he was shot, stabbed, punched in the groin and left bleeding out. But we see him being taken care of and my thinking is, he’s going to make it. You denied Tavo what he so much desired — and maybe the audience — a final showdown with Tom Chandler, the hero he wanted to beat so he could prove he was his equal. I didn’t want to give Tavo that satisfaction. He was so obsessed with Tom Chandler, that he took a reasonable philosophy [making things better for Latin America] and became delusional, becoming a tyrant because he wanted to be like Tom Chandler. One version of our script had him run away and then found and shot in a pigsty. But we decided that the final insult would be that Tom wouldn’t even bother to come and have a face-off with him. Some TV stars are pulling in extra-exorbitant paychecks, while others seem to be pretty underpaid. Did five seasons give you the time to complete the story you wanted to tell? Absolutely. Without leaving California, we were able to viewers from the North Pole, to Asia, the Mediterranean, and South America.. Would I have loved to have more seasons working with our partners in the Navy? Yes. But I feel like we told the show we needed to tell with Chandler at the end done with war and wanting to live in peace.